The HP97 Emulator program was designed to emulate the behavior of Hewlett Packard's HP-97 calculator. 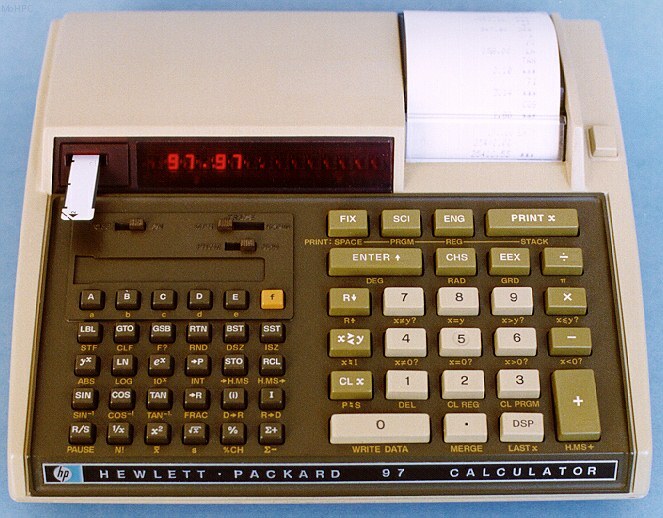 Originally developed back in 1976, the HP-97 was truly one of the most advanced personal calculators of its day - providing the kind of computing power normally available only on large mainframe computers at the time. The calculator had all the basic features of a modern computer: printer, magnetic storage (cards), and memory for storing data and programs. Programs, at their most basic level, were created in programming mode by entering key sequences in the order a user would normally use to perform a calculation. They could then re-play the sequence of steps to repeat calculations. In addition, functions for doing statistical and mathematical functions were builtin to the calculator - square root, logarithms, and trigonometric functions provided truly advanced calculation abilities. My first exposure to this machine was at the age of 14 when my Dad brought one home. I wrote my first programs on this machine. One of those early programs (Blackjack.hp97) is provided with this emulator program. The emulator is my homage to this wonderful machine and the geniuses at HP who designed and produced it.